Because the Sarca River originates in the Dolomites region of the Italian Alps, there are several noteworthy points of interest as well as many nearby hiking trails with remarkable scenery and historical value. 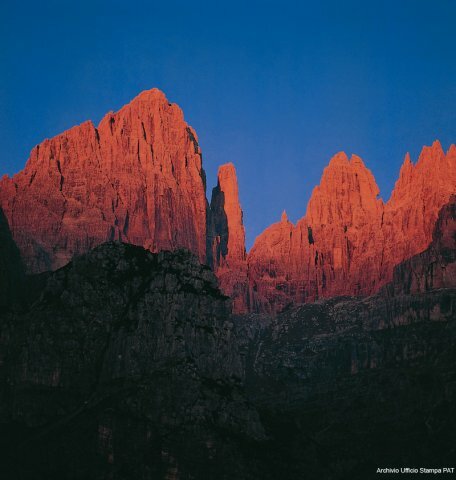 In 2009, the Dolomites were inscribed on the prestigious Natural World Heritage List, thanks to the extraordinary beauty of the landscape and the outstanding geological importance they play in the history of the Earth. There are 9 Systems of the Dolomites scattered throughout Northern Italy. Tione di Trento is nearest to the Brenta Dolomites, which make up the westernmost part of the Dolomite region, on the western border of the Province of Trento. This chain is a Dolomite island covering an area of 11,135 hectares bounded to the west by the Giudicarie valleys, to the east by Val di Non and to the north by Val di Sole. Approximately 90-minutes from Tione di Trento, and a part of the Parco Naturale Adamello Brenta, you will find the largest glacier in Italy, the Adamello glacier.